7kg load capacity, FS2 stepper motor controller (30V). Only for lens systems with aperture of up to 90mm! Equipped with a 2" Vixen dovetail clamp. 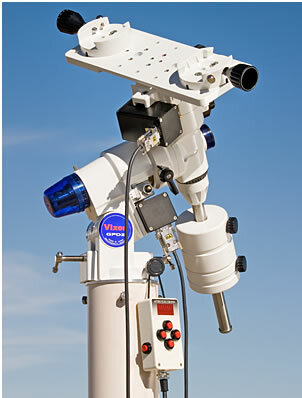 A 2" double adapter, ALccd5.2 auto guiding camera and a MiniBorg guide scope also form part of the package. Interfaces: ST4- and serial interface Connections: hand controller, RA and DE motors, serial interface, encoder, 2 auto guide sockets (one RJ12). Automatic positioning is possible via FS2 control box or via Computer. between the computer and the FS2 is not required.